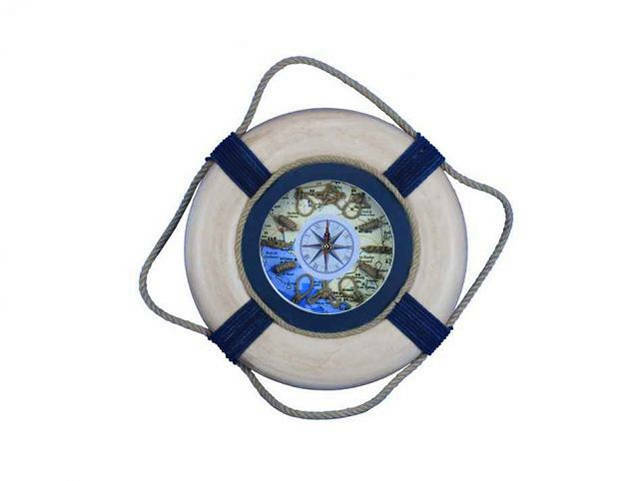 A decorative plethora of functionality and grace, the Vintage White With Blue Rope Bands Decorative Lifering Clock 15" is classy and functional all while creating the perfect nautical mood in your home, office, or pool house. A Nautical star is displayed in the middle of the clock with roman numeric characters at the end of each star point for an elegant touch. Sailors knots mark individual hours, and the real map background supplies a strong feel of being on a real ship.